This is a great dish when you don’t want to expend a lot of effort, have no plan, and just want something simple and nourishing. Like a Friday night at the end of a long week. Just pull random vegetables out of the fridge. Chop. Roast. Serve with spiced quinoa. It’s also really good with tahini sauce. Maybe make a green salad. Maybe. Whatever you serve along with these roasted veggies, they punch above their weight. You can’t go wrong. Preheat the oven to 350 degrees. Put the mushrooms, tomatoes, peppers, onion, fennel, and garlic in a large roasting pan. Sprinkle the salt evenly over the vegetables and drizzle with the oil. Roast in the preheated oven for 1 hour. Remove the pan from the oven and turn the vegetables. 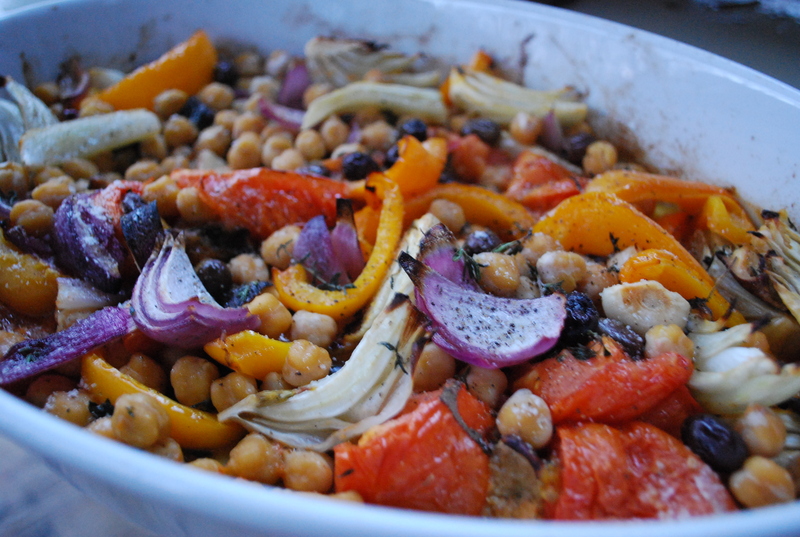 Add the chickpeas, olives, and thyme sprigs. Return the pan to the oven and roast for another 30 minutes, until the edges of the vegetables are just starting to blacken. Serve with spiced quinoa, tahini sauce, and salad.